I skipped Tuesday's speed workout due to a timing conflict but I put it back on the schedule for today. According to my training plan, this was supposed to be a tempo run that peaks at 10K pace. I've gotten out of sync on my speed work and thought I'd do intervals instead. Although this morning's weather was very nice, I was running behind schedule and elected to save time by staying indoors. It wasn't until I got on the treadmill that I decided which workout to follow. Thinking at first that I'd run intervals, I began with a warm up at half marathon race pace. I wanted to go into the repeats with a harder than usual effort to prime myself for speed. Once I got going, I considered the tempo idea. I then thought about SIOR's suggestion that I introduce some sustained speed into one of my weekday workouts for a couple of miles. I decided to continue with this half marathon pace for the duration of the run. Except for intervals, I have not done many runs lately at sub-10 paces. This is because I've focused on endurance and distance rather than speed. I was surprised to find myself comfortably running at a mid-9:00 pace this morning. I wondered if I could keep this pace the entire way through and it turned out that I could. All this distance and hill running are clearly helping my stamina. It's scary to think that I only have four more training weeks before my taper week. The longest run I've done so far this year is eight miles, but I did fairly well with that. I'm hoping that I'll continue to progress as I move into double digits. 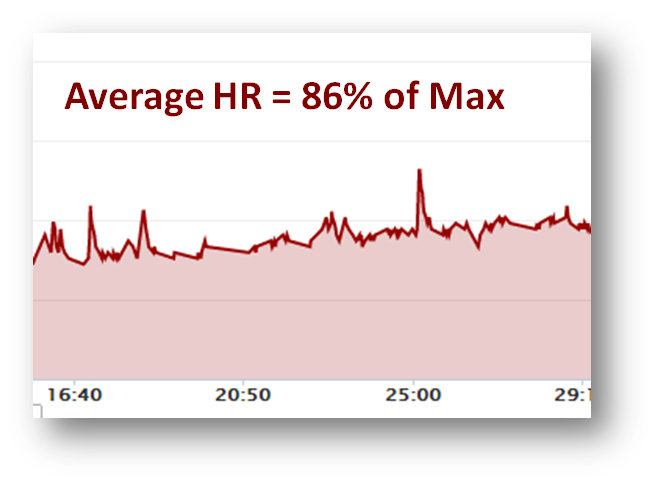 My average HR finally exceeded 85% of max today. If I can push a little harder and sustain it, I should start seeing my speed improve as well. Keep it up! Do I smell a PR in Brooklyn for you? Thanks TPP. I'm not thinking PR at this point. My goal right now is to break 2:10 again. I definitely think you could run the half in 9's. No problemo. Only four more weeks?! Yikes! I know! I hope you're having fun in Boston right now. This is the BIG one. You will do great. Try to remember as many details as you can during the race. It's hard to do that, but we will want to hear everything.